ECC is dedicated to our clients’ success. Our collaborative approach as a solution-provider develops a true partnership with our clients giving them peace of mind and relieving them of the burdens associated with regulatory compliance. Our experienced team of professionals is responsible for the identification, packaging, and labeling of waste for its proper transportation, treatment and disposal. 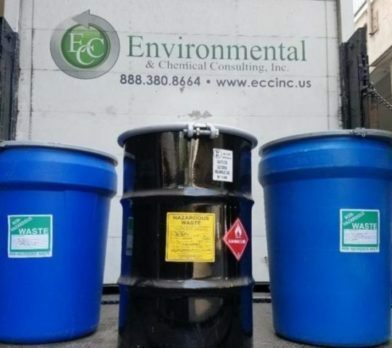 ECC collects, hauls and disposes of the following hazardous and non-hazardous waste streams: Call us for specific waste stream disposal prices. “In business there is no substitute for a personal connection, some might call this customer service but they are in-no-way the same thing. Good customer service is usually tied to a gratuity at the end of a meal, a personal connection is what happens when a trusted vendor has your back and expects nothing in return for it. This is what you need when managing hazardous waste streams, because one mistake here could have a far reaching negative impact on your business. I have found this type of relationship with ECC, which is a truly rare thing in the hazardous waste business. And I should know because I have worked with so many unscrupulous waste company’s over the years that I have lost count. — Phil, Environmental Health & Safety Manager, Major Roofing Mfg. Environmental & Chemical Consulting, Inc.